Isabella House is a non-profit, non-sectarian healthcare organization that provides a continuum of services to the elderly on its campus and in the community. Three board members of SANYC gave a 2.5-hour hands-on workshop for 12 residents of Isabella House, creating a communal banner. Creativity Explored is a non-profit program for adult artists with developmental disabilities that gives them the means to create and share their work with the community, celebrating the power of art to change lives. In 2017, SANYC returned to Creativity Explored to provide 5-day workshops at each of their two locations. The artists wove fabrics that were then made into pillows, wall hanging, purses, pouches, and pins for the artists to keep or sell. Building Bridges of Hope is a 12-week art therapy program for immigrant mothers with young children who have experienced trauma. 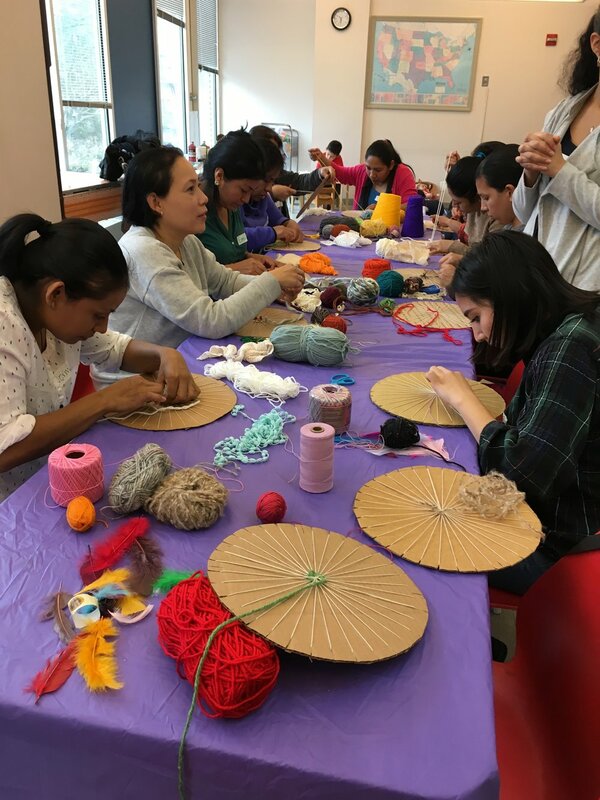 In 7 of the 12 sessions of the 2017-18 fall/winter sessions, members of SANYC taught the mothers weaving on the SAORI loom and circle weaving. From the fabrics created, the mothers sewed pillows and zippered pouches and made dream catchers. Participated in memorial event for victims of the earthquake and tsunami on March 11, 2011. Creative Growth is an non-profit that serves artists with developmental, mental and physical disabilities, providing a professional studio environment for artistic development, gallery exhibition, and representation. Three members of SANYC provided a 5-day workshop on SAORI weaving, The artists wove a communal fabric that was made into a coat and hat. 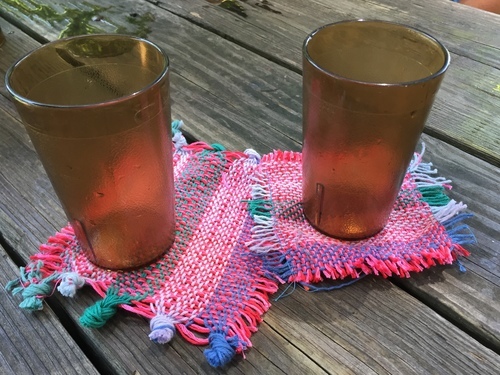 In July 2016 three board members of SANYC gave a 5-day a Guest Artist Workshop introducing the artists there to SAORI weaving. The artists created a communal banner that was later sold in the Creativity Explored gallery. Thanks for featuring us on your blog Creativity Explored! 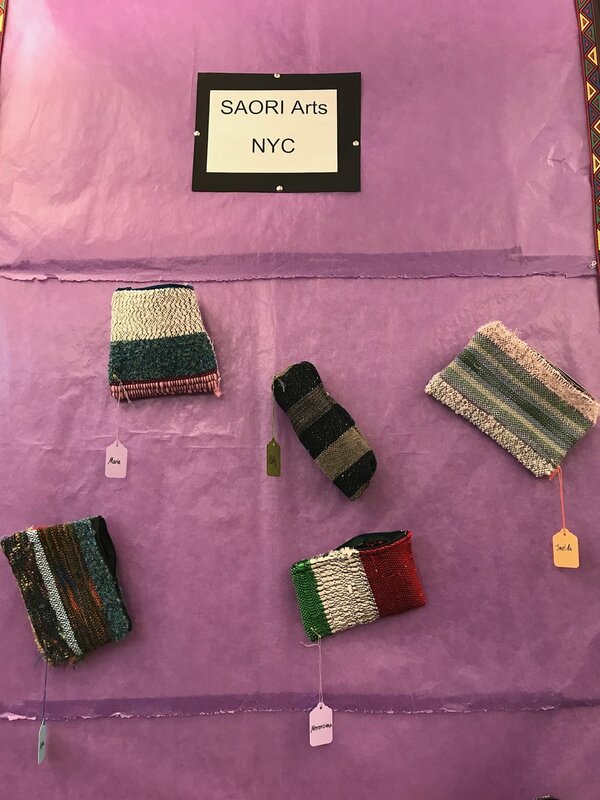 In celebration of NY Textile Month, SANYC raised funds and sold SAORI woven goods. Participants could weave on a SAORI loom. The event was held at Manufacture NY in Brooklyn. Members of SANYC participate in Art Works fundraising auction. A loom available so participants could experience SAORI weaving. 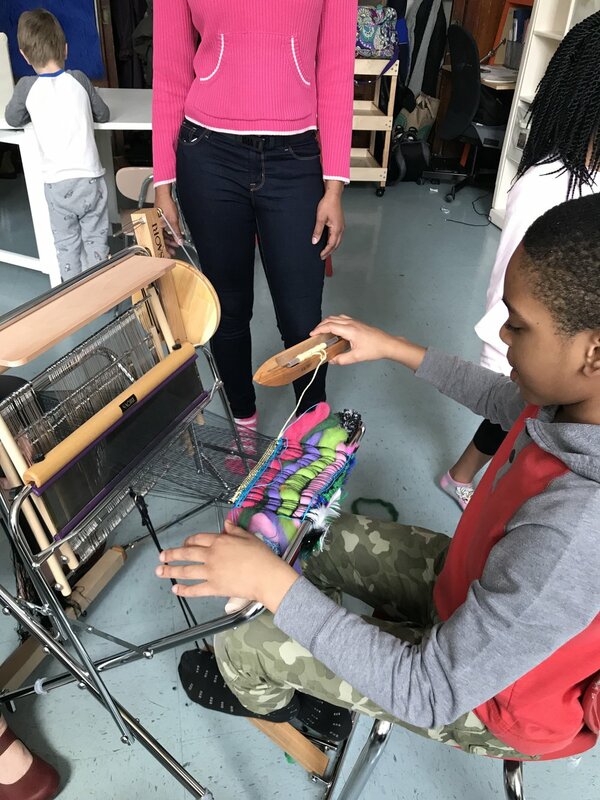 Ria Hawks made a presentation about SAORI weaving and SAORI Arts NYC non-profit. A SAORI woven tapestry was donated for auction. Two full day workshops demonstrating SAORI weaving techniques to art therapies and allowing them to explore free weaving for use with clients in a variety of therapeutic settings. A presentation discussing experience of SAORI weaving for people living with disabilities, chronic illness and life threatening illness. SANYC donated woven goods and participated in Syrian Refugee Benefit art gala. This provided an opportunity to network and informed participants about SAORI weaving method. April17-29: FASHION SHOW AND EXHIBITION "BEAUTY WITHOUT INTENSIONS"
In a collaboration with Fashion Institute of Technology SAORI Arts NYC provided fabrics created by Japanese weavers with special needs, which the FIT students incorporated into the clothes they designed. The event was held at the Tenri Gallery in Manhattan. The work remained available for viewing for 10 days. Hosted by the New York Presbyterian Morgan Stanley Children's Hospital, SAORI Arts NYC was a proud sponsor of this event. Ria Hawks provided an open loom and assistance to those who wished to weave a banner in Honor of Sickle Cell Month, September 2015. The completed banner was displayed at the end of the event. Yukako Satone made a presentation introducing SAORI to art therapy professionals to use in their practice.